I tried this on OSX. It probably works on Windows too. In this article we create a container with mongodb and some contents and then connect to it from another container. Just for personal reasons the client container is really a “aspnet container” and not connected to mongodb to start with. Even though I liked typing my way around Docker I tried and discovered the free Kitematic by Docker. It gives me a very simple overview but I hope it to evolve some in the future to include a little more, like the git-githubdesktop-sourcetree journey. Open Kitematic and create a mongodb container. Select Exec to get a terminal. for each call where “n” denotes the number of records inserted and “ok” the success. See what we have of databases again, to find the new database “projects”. 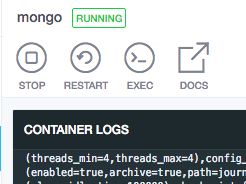 Now we have a container running mongodb with data in it. You can leave mongodb and the container but make sure it is not stopped. Containerising is about selecting an image and then adapting it to you needs. 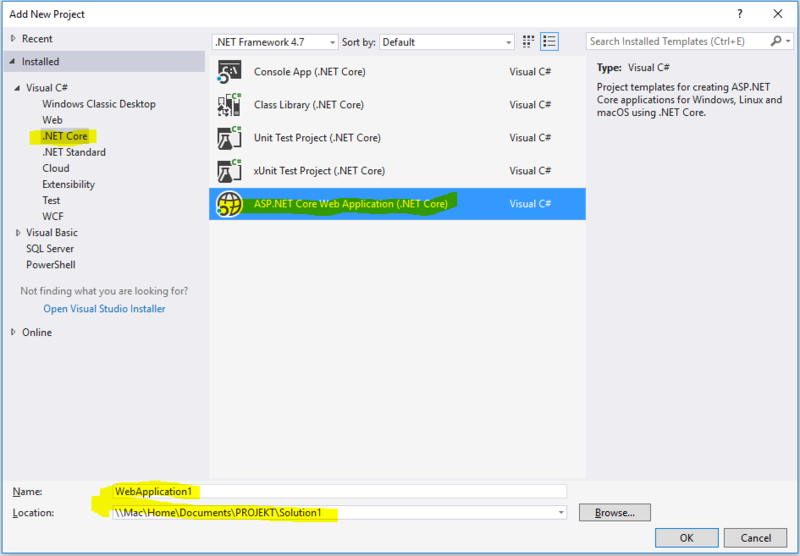 I use a lot of dotnet and hence choose to select a dotnet core image. Search in Kitematic for “aspnetcore” and select one. Which to chose can be complex; by the time of writing there are 2 from Microsoft. Which to choose is another subject and also subject to change. When the container is started update it and then install mongodb. Note: Updating the container with apt-get is something one probably don’t do as such tasks should be scripted. But here we are experimenting. We don’t want the database in this container, only the client, but is easier to find an apt-get for the whole database than for just a client. We now have 2 running containers and if you didn’t fiddle around too much they are sharing network. There we have the IP addresses. Out of the box Docker containers don’t have a name resolution so we’ll use the IP address to connect. Two connected containers, one running a mongo database and one connected to it and prepared for aspnetcore love. I happen to have OSX as host and Win10 as virtual machine. I have also mapped a folder so it is reachable from both OSX and Windows. 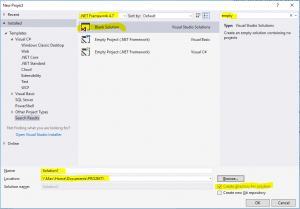 Whatever dotnet version is visible at the top of the dialogue is not of interesting as we are creating a solution file and not much more and then we add Dotnet core specific stuff. You can search for the template through “empty” or “blank”. Dotnet version is still not necessary as it refers to Dotnet framework and we are caring about Dotnet core. 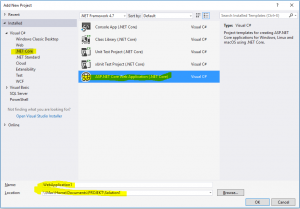 Select Dotnet core 1.1. This text is written in August 2017 and Dotnet core 2 is due November. Select WebApi. Do not add docker support. It would probably not make any change but in this exercise we are targeting running the container in OSX. If you change your mind and do want Docker-for-windows support you can always do that later with the click of a button. When the project is added compile and run to see that all cog wheels are in place and in working order. Tip from the trenches: Ctrl-F5 compiles, starts the web server and pop ups a web browser in one click, without having to start the debugger. Note the URL. It is something like http://localhost:2058/api/values where /api/values is something to briefly remember. See that in the browser window there is the text [“value1″,”value2”]. It is created through the Get method in class Controllers/ValuesController.cs the “normal MVC way”. 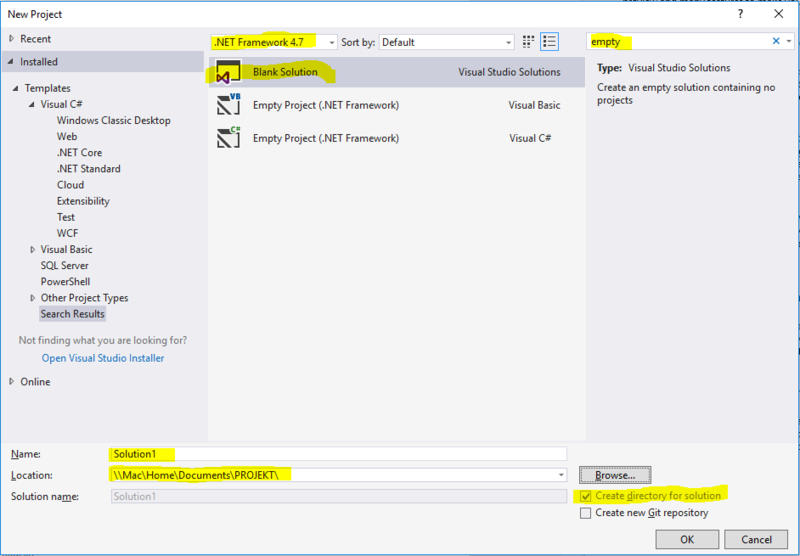 If you right click the project (=activate the context menu in the solution explorer pane on the WebApplication1 project) there is a choice “Publish…”. AFAIK it is used for Windows or Dotnet framework stuff so leave it be. Instead we use the CLI for restoring, publishing and activating. Then restore the files with dotnet restore. Restoring in this case means pulling in all dependencies so we have everything we need. Restore completed in 1,58 sec for V:\Documents\PROJEKT\Solution1\WebApplication1\WebApplication1.csproj. Restore completed in 1,81 sec for V:\Documents\PROJEKT\Solution1\WebApplication1\WebApplication1.csproj. As we didn’t specify an output path we get the result in bin\Debug\netcoreapp1.1\. Note the back slashes and that I never said to change OS. We have just started the web server in Windows. You should have [“value1″,”value2”] as output. Nothing surprising. Shut down the application (ctrl-c in the console) and refresh the browser to verify that we really are surfing to our site and not Visual studio and IIS(express). If you want to go spelunking in the container try opening a terminal directly or connecting one. If you do a dotnet run now you get an error. Alas restore, publish and run. Restore completed in 784.3 ms for /Users/username/Documents/PROJEKT/Solution1/WebApplication1/WebApplication1.csproj. Restore completed in 1.7 sec for /Users/username/Documents/PROJEKT/Solution1/WebApplication1/WebApplication1.csproj. Why we need to restore it again is something I haven’t grokked yet. To be honest – if I hadn’t tricked you into, unnecessarily, restoring on the Windows machine first you wouldn’t have noticed. You can of course open a web browser to do the same. Don’t forget to stop the application if you want to continue as otherwise a file might get locked. Install Docker on your mac unless you already have. You can probably do whatever is described here on your Win10 machine with Docker for windows. But I happen to have OSX and a virtualised Windows10 through Parallels. It is said to be possible to run Docker for windows in Parallels but then I have to fork out another 50€ (per year?) for the Pro version; and having a virtualised Windows to virtualise yet a machine creates a performance penalty also on the host OS. My machine is running warm and noisy as it is. Caveat: For almost a full day I got the error message docker: invalid reference format. which was wrong because when I rewrote the very same text it suddenly started. My first guess was that there was a hidden character somewhere but I rewinded to an earlier command that had failed and suddenly it worked. I did not want to make this quick start unnecessary complex by having lots of different ports so everything is running on port 80. With that said; as Kestrel (the web server we instantiated in Program.cs runs in aspnet it talks on port 80. Then we open a hole in the container from port 80 to port 80. This latter is what -p80:80 means. This gives us a terminal, of sorts, and something about how it receives commands. This one cleans up after our run so there is no halted container wasting hard drive space when the container stops. This parameter lets the continer use /Web to reach folder /User… where we have put our code. This is the name of the image we use. An image is to a container what a class is to an object. 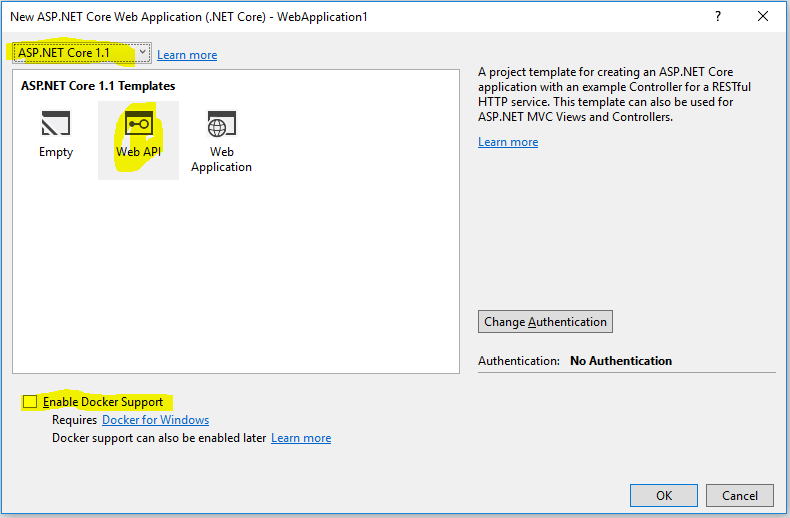 In this article we don’t adapt the microsoft/aspnetcore image, created by microsoft especially to run aspnet core solutions, to anything but use it as it is. As we have not specified a version we get the latest. Microsoft has many images for different uses. Execute a command in bash. The command happens to be “start the web server”. Yay! The web server in the container runs your dotnet core web application. Now we have a web site compiled and ready to run with [dotnet run]. You can run the app and then [curl localhost] to find out if it is runnable; but if you got no error message earlier all should be ok.
Go to the Dandelion folder. docker build -t yourname/dandelion . Note that the name must be all small caps. Don’t miss the trailing period. If you want to check that the image is created just execute [docker images] which should show the new image at the top of the list. and your web should start. or go to localhost in your web browser. Docker and Dotnet Core 1.1 should be installed on the host (=OSX). You have a folder somewhere, for instance /User/yourname/Documents/Docker/mywebapp. docker build -t mynick/myimage . in a terminal in said folder. you can se the new image as mynick/myimage. (after you have have updated “YourRootedPathAndFolder” appropriately. on your host to receive a smaller waterfall of HTML. Project theapp (.NETCoreApp,Version=v1.1) was previously compiled. Skipping compilation. in a terminal. Note the Container ID. Then execute, after the b5a…f5 is updated appropriately. Create a folder and to to it. A pile of HTML should scroll into view. In the first terminal you can see the reaction. Create a file named Dockerfile in a new folder. docker build -t yournick/yourimagename . and you should se a whole dab of HTMl. You can also watch it in your browser. Go to you your local Documents folder. Create a Docker folder. Inside it create a dotnetcore folder. This results in /Users/myname/Documents/Docker/dotnetcore. This will download the microsoft/dotnet image, start it, connect your host’s dotnetcore folder to an app folder inside the container, set an environment variable, publish the internal port 80 on port 80 and finally open a terminal inside the container; all in one go. This will also compile the code before starting the application. 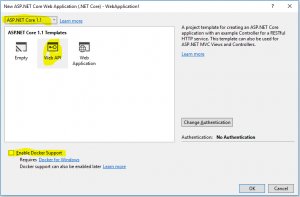 in your host’s web browser you should now see a page about Dotnet aspnet core. That all there is to it! Then you attach a terminal to the running container. and you should get a boatload of HTML back. In the other terminal window you should see some reaction to the request.